When you browse through our assortment of candle accessories, you will find that we have a nice assortment of Tart Warmers. The Dish Style Tart Warmer is a nice option for a medium to large size room. 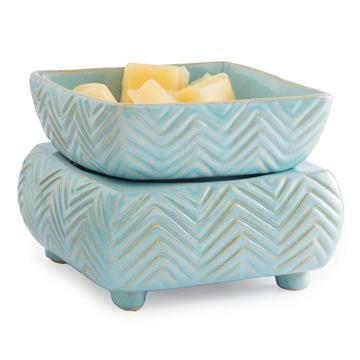 Select our Soy Tarts or Soy Melts in over 75 different scents to use with this warmer. The Plugin Style Tart Warmer is a great option for a small room such as a bathroom. Our Soy Melts are the best option for this size warmer. The package of 6 cubes are just the right size. We also offer the Wick Trimmer and Wick Dipper candle tools. The Wick Trimmer is a must have with a cutting foot that trims the wick to the preferred height and catches the cut pieces at the same time. It is especially useful for wick trimming on our 16oz Mason Jar Soy Candle due to the height and width of the jar. The Wick Dipper is also a handy tool as well a nicely decorated with beads and charms. Pairing these tools with one of our soy candles is a great way to put together a gift package for that special someone. Our Fire Starters are also found in this category. While they are cinnamon scented, their purpose is not to provide fragrance but to help make starting a fire easier. A quantity of four come packaged in a reusable, burlap bag. Great for campfires, fireplaces or wood stoves.